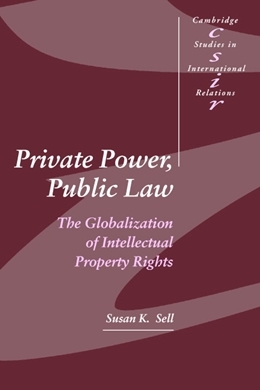 Susan Sell’s book reveals how power in international politics is increasingly exercised by private interests rather than governments. In 1994 the World Trade Organization (WTO) adopted the Agreement in Trade-Related Aspects of Intellectual Property Rights (TRIPS), which dictated to states how they should regulate the protection of intellectual property. This book argues that TRIPS resulted from lobbying by powerful multinational corporations who wished to mould international law to protect their markets.